* This article originally appeared in the NAHA Aromatherapy Journal Summer 2014.2 and is also published with permission on the International Journal of Professional Holistic Aromatherapy’s blog. In many states, a practitioner can be criminally charged with practicing medicine without a license for offering alternative therapies such as herbal medicine, homeopathy, and aromatherapy. This is also the root issue that spawned the “Health Freedom” movement, which supports patients’ rights to access alternative treatments and health practitioners of their choosing. California law provides a useful example of this type of restriction: “The unlawful practice of medicine is defined as: ‘Any person who practices or attempts to practice, or who advertises or holds him or herself out as practicing, any system or mode of treating the sick or afflicted in this state, or who diagnoses, treats, operates for, or prescribes for any ailment, blemish, deformity, disease, disfigurement, disorder, injury, or other physical or mental condition of any person...’ CA Stat. Sec. 2052.” Considering the many uses and therapeutic service benefits of essential oils, the wording above makes providing a therapeutic aromatherapy consultancy fraught with pitfalls in the state of California, even as a Registered Aromatherapist through the ARC. 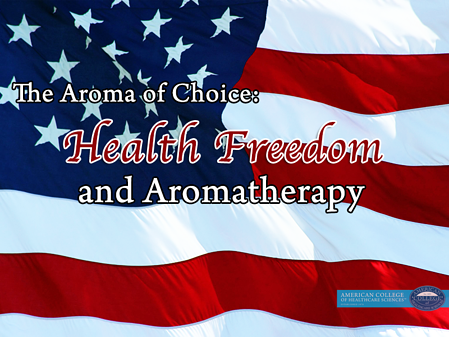 Safe Harbor and Health Freedom Laws: How Do They Affect Aromatherapists? Health Freedom and safe harbor laws mean greater opportunity for Registered Aromatherapists to practice ethically without fear of violating the rigid and over-arching definitions of “practicing medicine without a license.” The legal structure of a safe harbor bill or law can allow non-licensed practitioners to legally operate, as long as they comply with the provisions stated within the safe harbor law. It’s extremely encouraging to see our industry progressing. However, even though our society and the allopathic medical community are becoming more comfortable with the idea of alternative modalities like aromatherapy, there are still many states without Health Freedom laws. While the Health Freedom movement is growing and legislation is changing, aromatherapists have an obligation to uphold the highest standards and ethics to maintain integrity within our industry. Has health freedom come to your state? Share your story in the comments!